We believe that each project is unique, and therefore requires a fresh approach. Getting a project off to the right start involves listening. We take the time with our clients in the early stages of a project to establish a clear and effective brief. Although we have a great deal of experience, we are never afraid to try new things and to listen to new ideas. Throughout the design process we will communicate our ideas through a range of tools, from hand sketches to computer generated images. We will liaise with all the necessary people, including planning and building control, to ensure that your building project always runs as smoothly as possible. As we are all aware, the need to protect our environment is becoming ever more important. We firmly believe that construction and architecture should play its part in reducing our consumption of carbon and creating sustainable places and spaces. We approach all our designs with an eye to sustainability and significant carbon reduction from the outset. We are an RIBA Chartered Practice, with ARB-registered Architects. We have a small but committed staff, who are passionate about creating exciting, well crafted buildings and spaces. Between us we have a diverse range of experience which assists in delivering our projects. Clive established Williams-Architects in 2004, with the vision of a practice that would run smoothly and efficiently to deliver quality architecture. 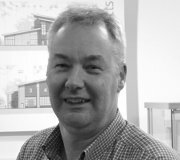 With over 25 year's experience in architecture, Clive has a depth of knowledge and skill which proves invaluable in moulding projects into successful buildings. Clive is the company Director, and oversees all projects to ensure that the highest standards are maintained.